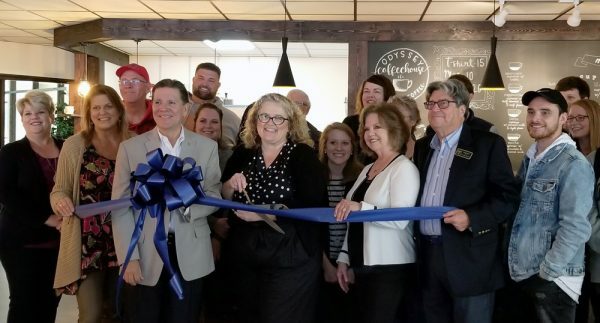 On Thursday, November 1st, TFC held a ribbon-cutting ceremony for the new Odyssey Coffee House located in the Parkerson Student Center. The coffee house officially opened earlier this semester and has been met with much enthusiasm from students, faculty and staff alike. The area offers students a place to meet and relax, all while enjoying their favorite java creations. Today’s event was hosted by the Toccoa-Stephens County Chamber of Commerce. In attendance was Chamber President Julie Paysen, along with several other chamber members. Also in attendance was Toccoa Mayor, David Austin and his wife, Michelle, both TFC alumni. The event was also attended by a number of faculty, staff, and students. Vice President of Student Affairs, Abigail Davis, addressed the group providing insight to the features of the coffee house. Most of the artwork was done by TFC students, and many articles of the coffee house were created using pieces from other older buildings on campus. The coffee is purchased from the Alpaca Bean Company in Lavonia, in an effort to buy locally. After use, the grounds are collected and used in composting at the TFC Farm. Dr. Myers was also presented with the “Industry Member of the Quarter” award from the Toccoa-Stephens County Chamber.